One of the best coffee maker that coffee experts recommend is the Bodum Santos Stovetop Glass Vacuum 34-ounce Coffee Maker. This coffee maker became very popular because of its physical appearance and its process of brewing the coffee. As interesting as chemistry, as stunning as sculpture, and as amusing as theater, Bodum Santos Stovetop Glass Vacuum 34-ounce Coffee Maker from Switzerland switch the ordinary brewing process of coffee into a clever and entertaining routine. This brewer can make up six 5 oz. 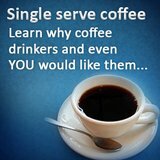 cups of fresh and flavorful coffee drinks. This coffee brewer can be assembled easily. All you have to do is to put water into the carafe; the filter will then be placed in the mouth of the tube or pipe in the upper pot, put coffee grounds in the globe. The globe must be fitted on the top of the carafe. Also, the tube must be extended in the decanter, and the decanter or the carafe must be placed on top of the stove with heat. The brewing process of Bodum Santos Stovetop Glass Vacuum coffee machine starts when the water boils. The boiling water passes through to the tube going directly in the globe to brew the coffee. After the brewing process is done, the carafe must be removed from the stovetop and you must set it on its associated shaped trivet. The coffee will then be drained throughout the filter and goes directly in the carafe. After that, you can remove the globe on top of the carafe and pour the coffee into your cup. The stopper of the carafe will keep the left coffee hot and fresh. 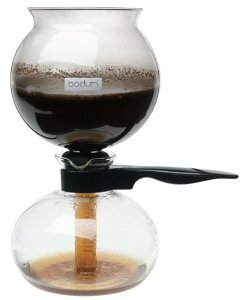 Of course, Bodum Santos Stovetop Glass Vacuum 34-ounce Coffee Maker being the best coffee maker has some cool features. 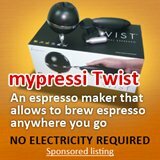 This coffee maker is made up of a durable gleaming nylon and heat resistant glass. Its carafe comes with a handle (stay-cool) and a stopper that keeps the coffee warm. All the parts of this coffee machine are dishwasher-safe so you can wash them properly. Pros: the coffee it brews is perfectly hot, flavorful, and not bitter. The brewing process is cool and fun. It is easy to clean. Inexpensive and Affordable. Its filter is reusable. Cons: it can only brew 34 ounce of coffee. Its filter is unreliable sometimes. It uses large amount of coffee grounds. Extra care is required because it is made up of glass. The instructions that can be found in the manual are limited. Bodum Santos Stovetop Glass Vacuum 34-ounce Coffee Maker is the best coffee maker that makes perfect cups of coffee by some though not agreed by all. 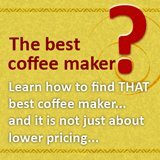 Guess that is the case with coffee filter brewer or a toastess coffee maker, some would like it, some would not. 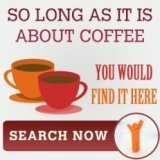 Do check out our homepage and read on your ideal coffee brewers before making that decision.